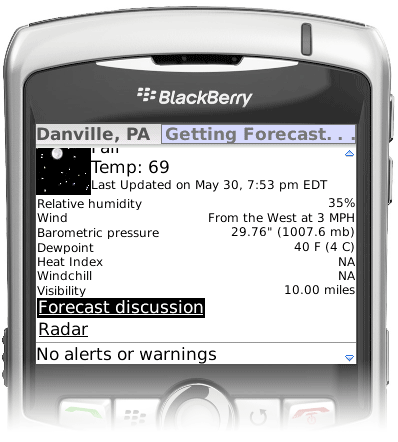 A weather application for Blackberry that downloads current conditions and forecast information from the US National Weather Service. For locations in the United States of America, NWSClient will locate the nearest National Weather Service weather station and display a number of observations including current temperature, relative humidity, wind speed and direction, and visibility. NWSClient will check for and display any warnings or alerts for the location from the National Weather Service. For most cities outside the United States NWSClient will fetch the current conditions including temperature, relative humidity, and wind, from Google. Additionally it will display a four day forecast. NWSClient will display the current temperature in the application icon on the home screen. The temperature will turn red and an alert icon will be displayed if the National Weather Service has posted any alerts or warnings for the current location. Added links to a screen showing detailed hourly forecast data for each of the next seven days. Increased the size of the temperature text displayed in the home icon for better readability. Fixed a problem where NWSClient would not show any current conditions if the XML did not include a link to an image icon. Over the air download for version 1.20 here. Built for Blackberries running OS version 4.5 or greater. Over the air download for version 1.21 here. This is identical to version 1.20 but specially tailored for install on the Blackberry Storm. Source code is available on github.com. NWSClient is free software distributed under the terms of the GNU General Public License. It is offered with NO WARRANTY, without even the implied warranty of MERCHANTABILITY or FITNESS FOR A PARTICULAR PURPOSE. NWSClient is not affiliated in any way with either Google or The National Weather Service. Showing the Recent Locations dropdown. Press enter after entering the location. NWSClient will contact Google Maps to translate the location into geographical coordinates and determine whether it lies in within the United States. If it does, it will determine the nearest weather station and contact the National Weather service’s XML data service to download the current conditions. The forecast information is downloaded for the actual coordinates of your location. NWSClient remembers the ten most recent locations entered. Clicking on the dropdown list to the right of “Recent Locations” in the options screen will display the list of locations and allow the speedy switching between frequently-accessed locations. By default NWSClient will download its data from the National Weather Service for locations within the US. Turning this option OFF will make NWSClient use only Google data for all locations. Note that this will turn off alerts and warnings even for locations within the US. 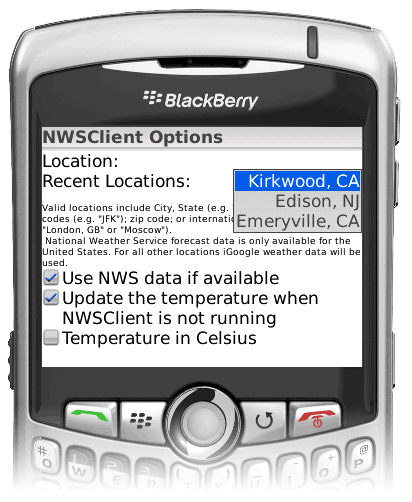 When this option is ON (the default) NWSClient will update the temperature displayed in its application icon on the Blackberry home screen hourly, even when the NWSClient application is not running. Turning this option off will prevent it from fetching any data when the application is not running. By default NWSClient displays temperatures in degrees Fahrenheit. Enabling this option will make NWSClient display most temperatures in Celsius (some NWS-provided temperatures such as dewpoint and wind chill are always displayed in Fahrenheit). If you choose to try NWSClient on a Blackberry with different hardware or OS Version please contact me with your results. Because I develop this software in my spare time I do not have the means to test a wide variety of software and hardware combinations. I will try to address compatibility issues and make NWSClient work on as many devices as possible. NWSClient uses the National Weather Service’s XML Data Feeds of current conditions and the National Digital Forecast Data SOAP Web Service for forecast information. NWSClient uses the Google Maps API to translate entered locations into latitude and longitude coordinates. 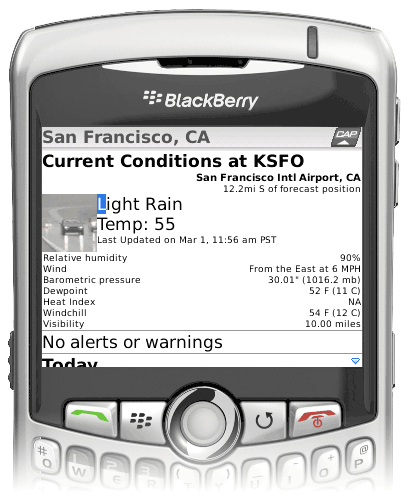 For locations outside the United States it uses an XML weather feed from iGoogle. NWSClient stores its own database of weather stations culled from this list. It locates the nearest one to any geographical point using a nearest neighbors search on a kdtree. Sometimes the NWS weather server gets overwhelmed by too much traffic and starts serving errors. In this case you will see messages like “Error: No forecast data found” where the forecast information should be displayed. If this happens please wait a bit and then click “Refresh Weather” in the menu. If the problem persists the NWS server may be down, which may be discussed at this Yahoo Groups forum. Over the air download for version 1.15 here. 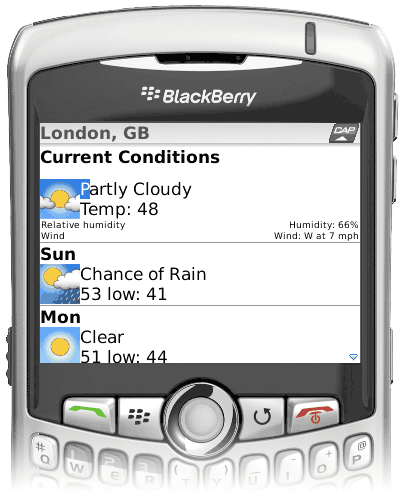 This is identical to version 1.1 but specially tailored for install on the Blackberry Storm. Over the air download for version 1.14 here. Built for Blackberries running OS version 4.5 or greater. Over the air download for version 1.13 here. (2009/06/01) This is identical to version 1.1 but specially tailored for install on the Blackberry Storm. Over the air download for version 1.1 here. (2009/05/30) Built for Blackberries running OS version 4.5 or greater. Over the air download for version 1.01 here. (2009/03/26) This is identical to version 1.0 but specially tailored for install on the Blackberry Storm. Over the air download for version 1.0 here. (2009/03/02) Built for Blackberries running OS version 4.5 or greater.